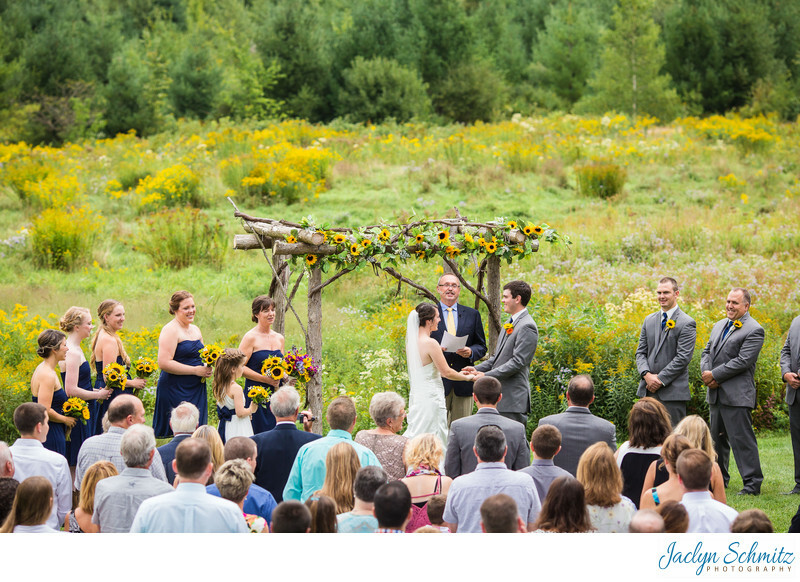 Vermont is known for its variety of beautiful, classic, and rustic barn wedding venues. 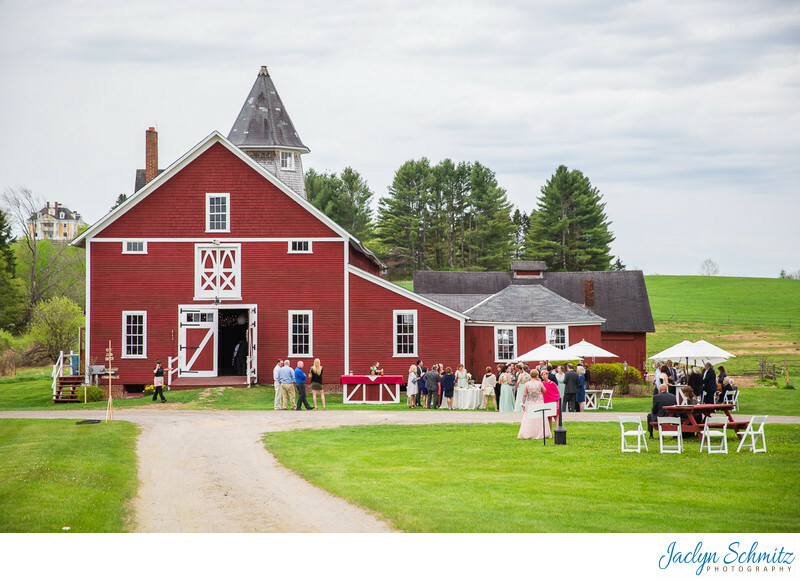 There are the classic red barns, rustic brown barns, and even white barns! 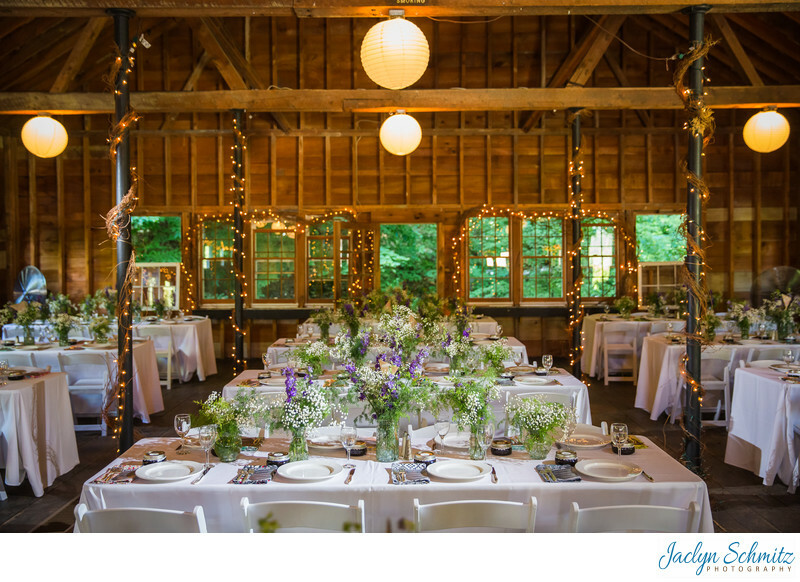 Some Vermont barns have huge chandeliers, some have a loft/second story, and plenty have separate on site lodging for guests and getting ready. 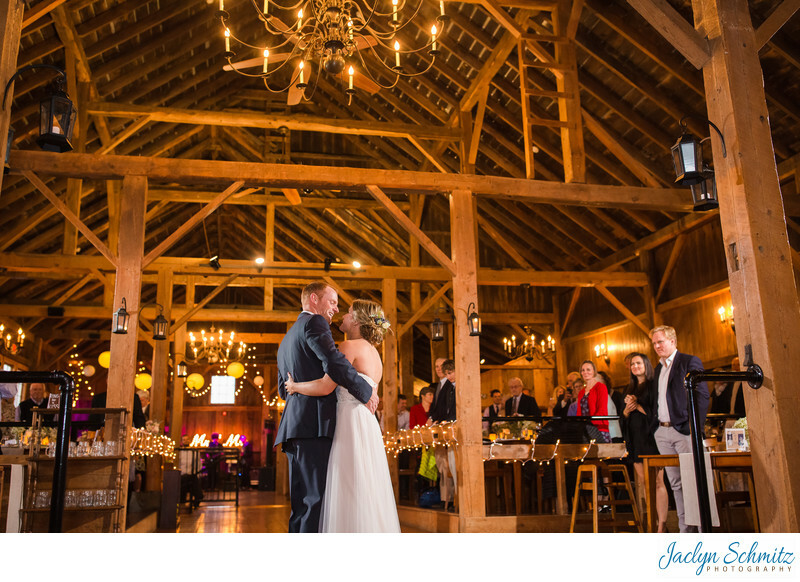 Some brand new Vermont barns have just started booking weddings and are eager to please, and other barns have a long history of beautiful weddings in picturesque locations. Many wedding barns allow outside catering, but some offer fantastic on site catering as well. 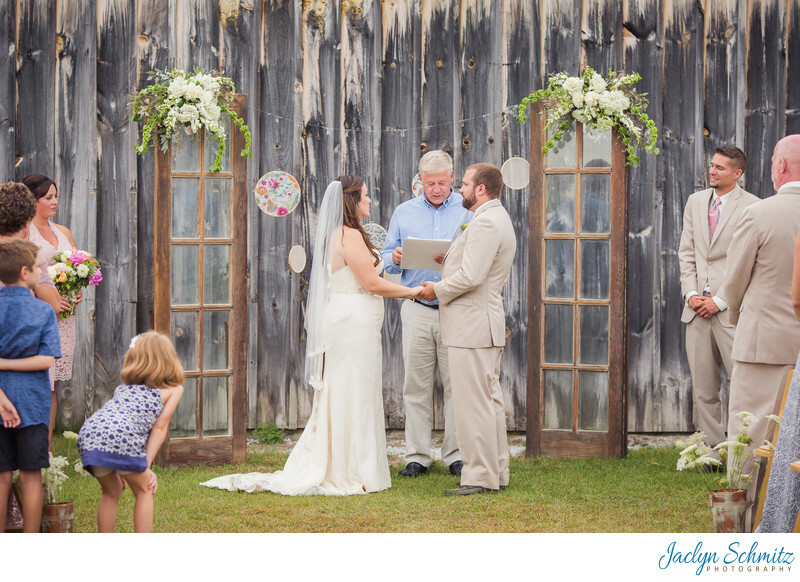 While each barn is unique, one thing is for certain: wedding barns in Vermont are sure to have amazing views! You can't go wrong getting married at a Vermont barn in the Spring surrounded by luscious green grass and beautiful tall trees, in the Summer with views of the lake, in the Fall when everything turns a brilliant orange-red, or even in the Winter when you can arrive to your ceremony by a horse drawn sleigh. 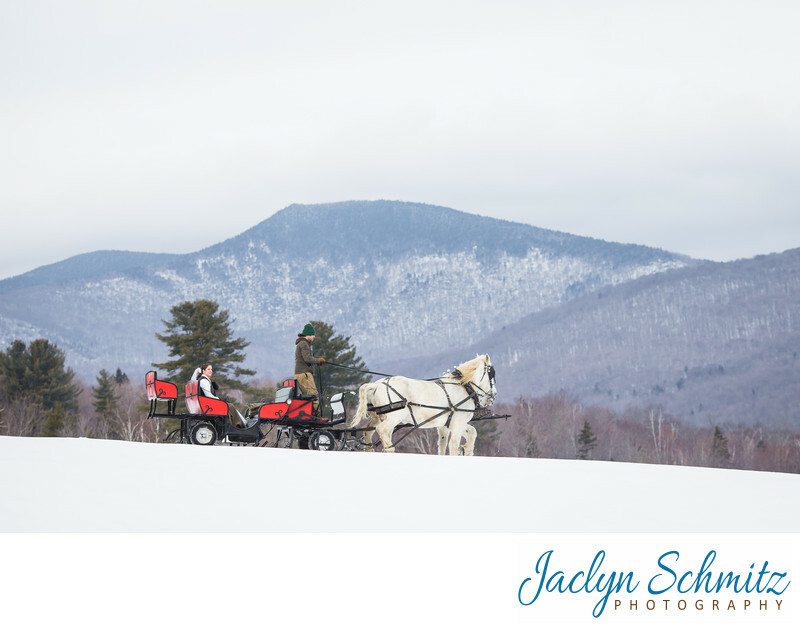 Below, I've included a list of some of the best barn wedding venues in VT that I've had the pleasure to photograph. 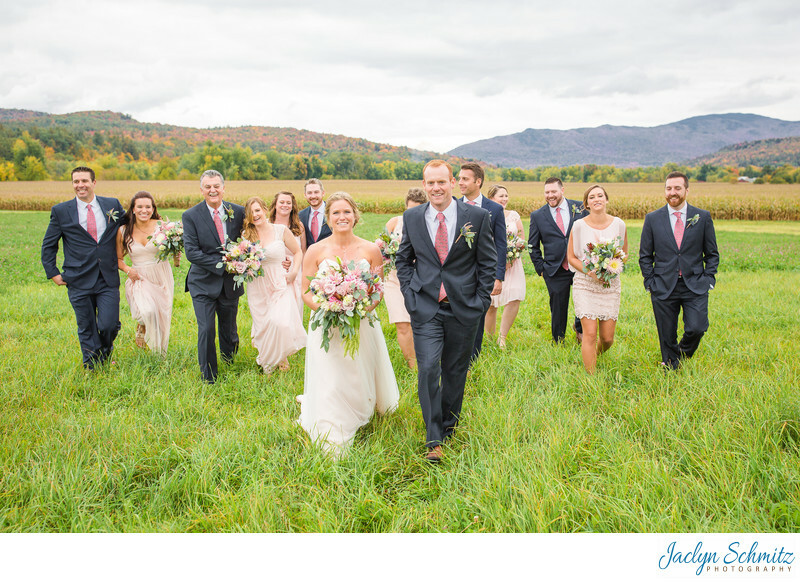 The 1824 House is a classic red barn wedding venue located in Waitsfield, Vermont, in beautiful Mad River Valley. Located on 14 acres, your family and guests can stay in one of the eight rooms of the house with the barn just steps away. 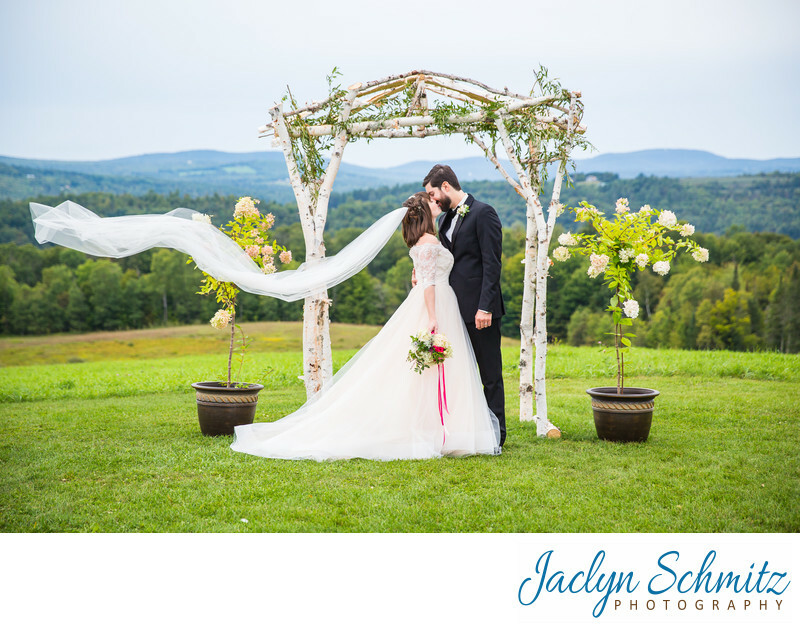 The ceremony takes place atop a grassy knoll with panoramic views of the mountains. 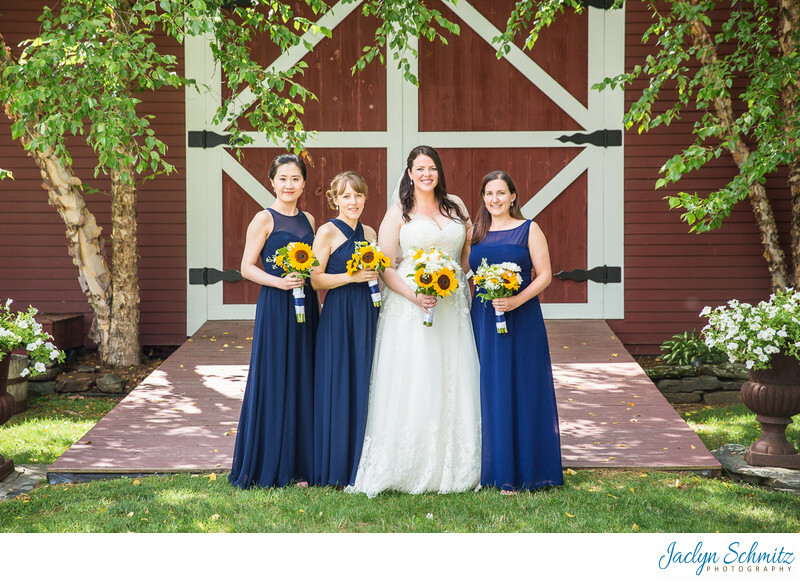 This intimate barn wedding venue is suited for smaller weddings if you want to keep everything strictly indoors, however a tent can easily be situated next to the barn for larger gatherings. A second story loft is a bonus at this venue: either as space for the band, or a separate area for lounging. It's also super fun for me as a photographer, because then I can take photos with an aerial perspective! This is the type of barn you'd probably imagine if you heard the words "classic Vermont barn." It has apple red siding with white accents, a peaked roof, and is nestled among 440 acres of rolling green hills. Built in 1883, the Inn at Mountainview Farm is located in East Burke, featuring a historic dairy barn that is the one of the largest farm structures ever built in Vermont. 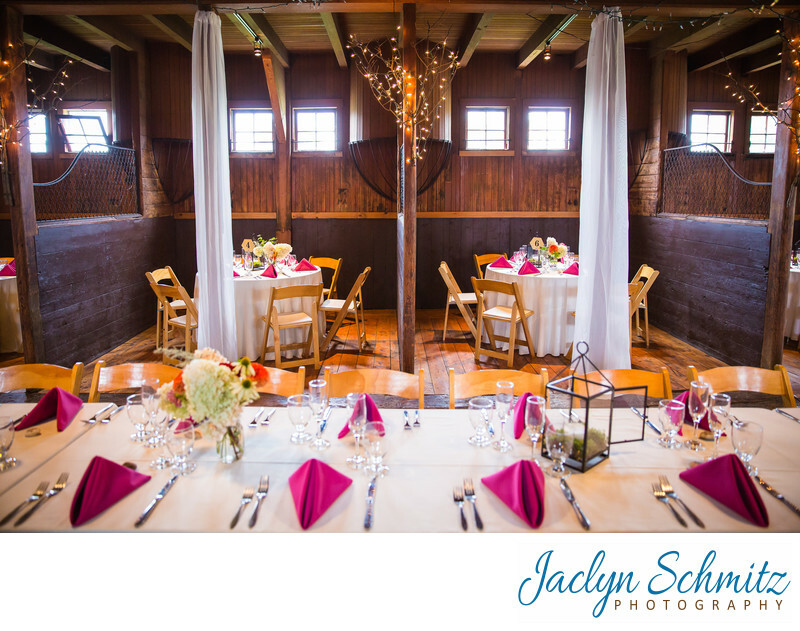 Since then, many of the Farm's buildings have been updated to accommodate weddings, including a 14 room inn for guests, a spacious bridal suite, and a converted horse barn for the reception (can fit 200 guests). 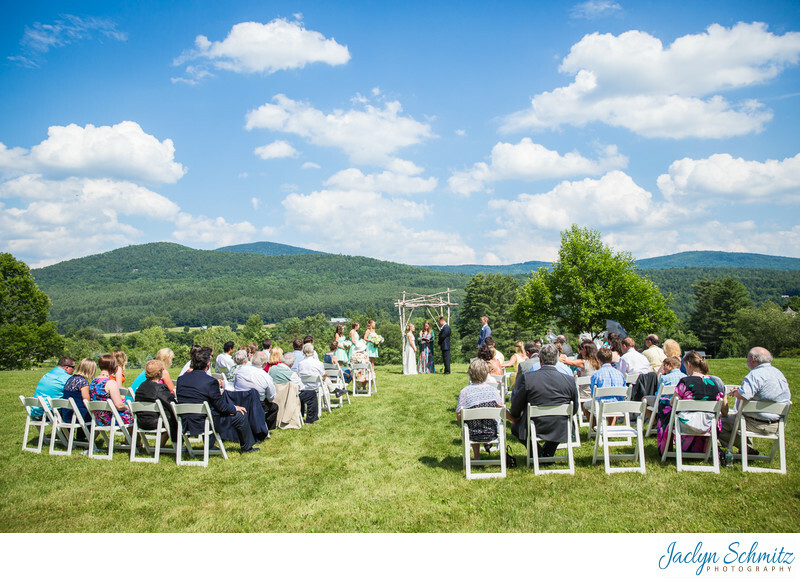 An amazing panoramic view of the Willoughby Gap serves as a backdrop for ceremonies. The Farm also operates an animal sanctuary, and if you're lucky you'll have a few visitors to take some portraits with. This 100 year old barn sits on 140 acres of gardens and forest, with views of the mountains and access to hiking trails and canoeing on the Battenkill River. While many Vermont barns are surrounded by wide open spaces, this property is special because it feels like the lush forest and mountains are giving you a hug. This is a secluded and private property surrounded by nature. 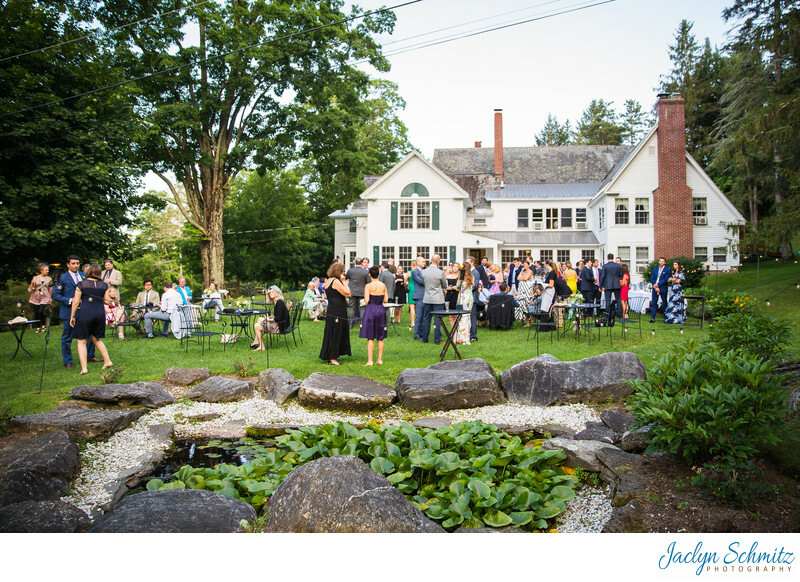 The ceremony is outdoors with mountain views, and cocktail hour takes place on the lawn with flower gardens and short stone walls creating a charming perimeter--there's even a lily pond. Up to 19 guest rooms are available for weddings, a professional chef and kitchen is on site for catering, and the barn can fit 240 guests. Alpacas also call this inn home, and can be seen roaming the property. 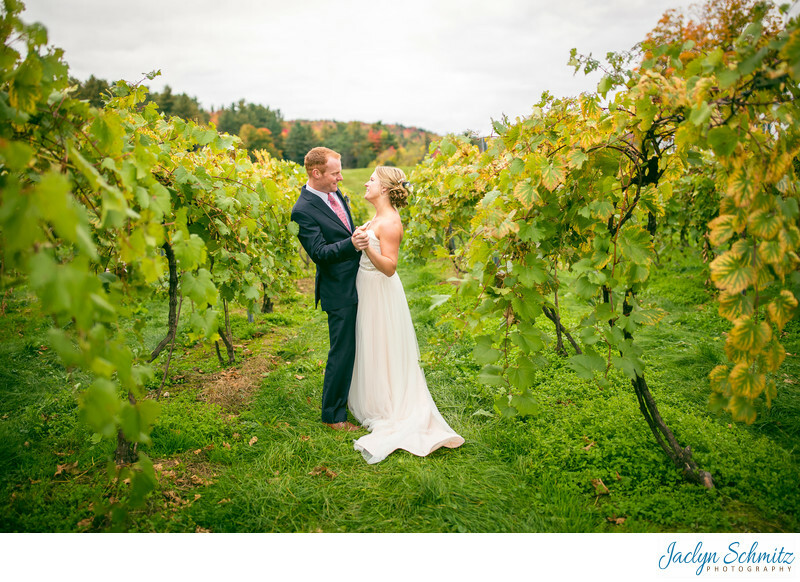 When you book your wedding at The Barn at Boyden Farm, you get a barn situated within wide open spaces of perfectly manicured lawn, fields of tall grass, rows of corn, and a romantic vineyard with rows and rows of grape vines to get lost in. 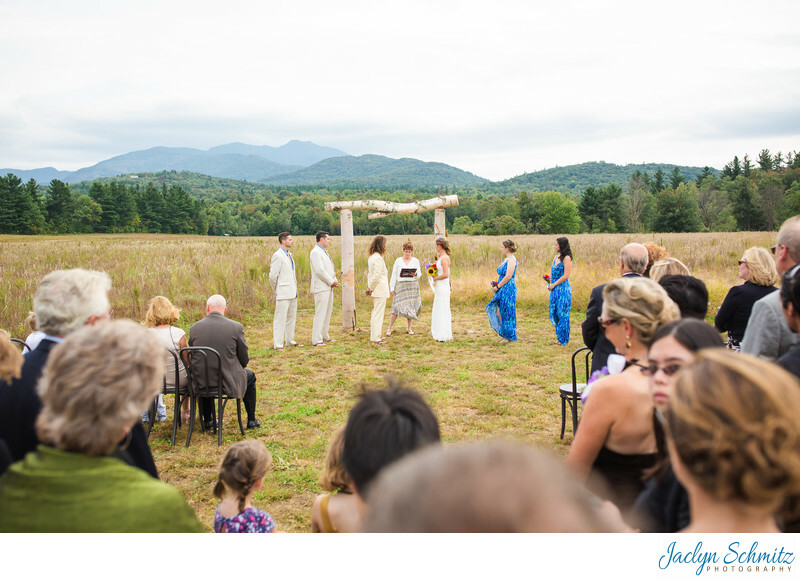 The ceremony location has wide, unobstructed views of the mountains. 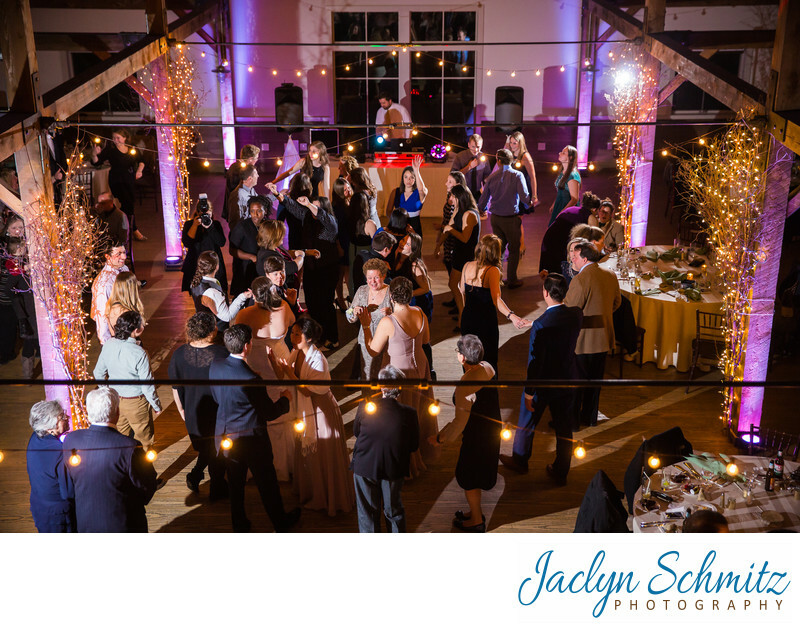 Inside the classic red barn you'll be in awe of the tall wood beams supporting vaulted ceilings and large rustic chandeliers and lanterns cascading soft, golden light throughout the venue. Kids (and their parents) at your wedding will appreciate a full blown playground tucked away outside the barn. 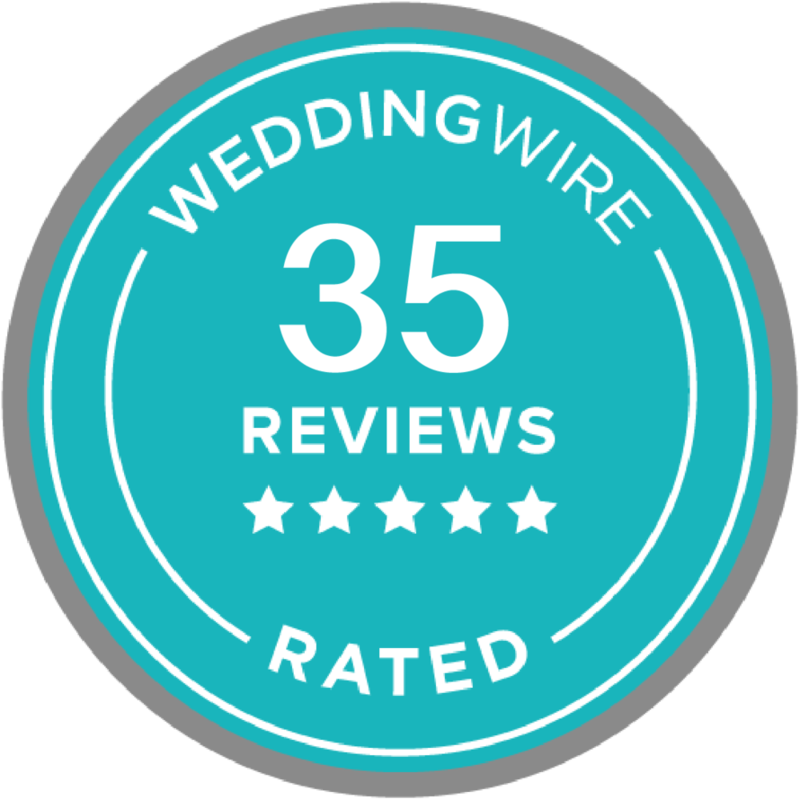 And one of the biggest perks when you book this venue is you have 2 additional days included, so you can set up early on Friday, get married Saturday, and clear out on Sunday; plus then you also have a rehearsal dinner location. 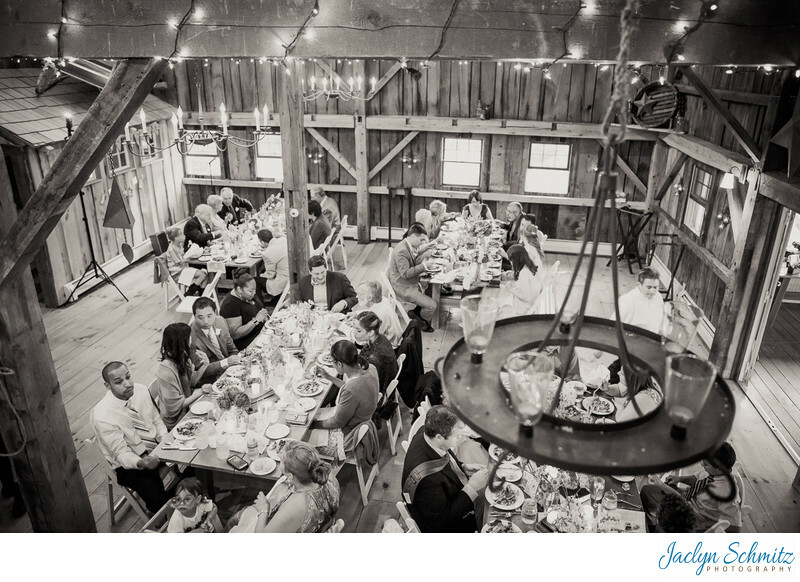 This 4000sqft barn can accommodate 150 guests and includes beautiful wooden tables and chairs. 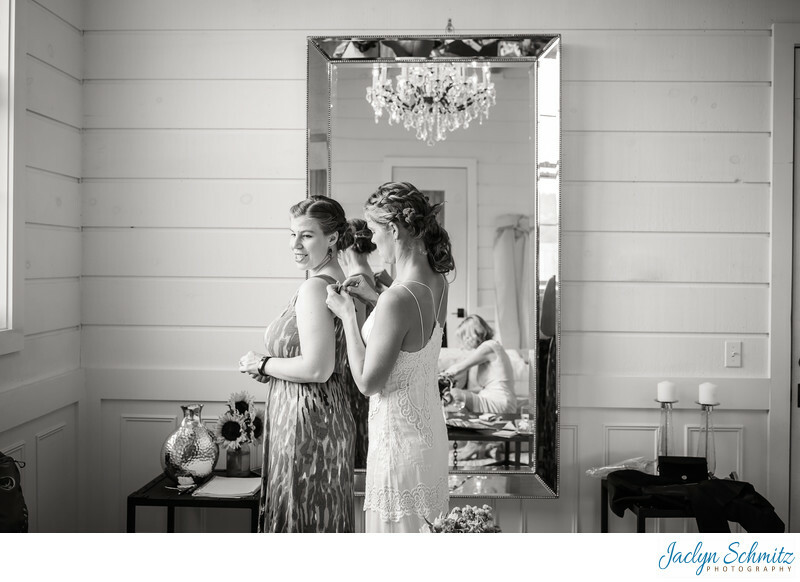 Looking for a modern, sophisticated, brand-new wedding barn in Vermont? The Barn at Smuggler's Notch is it. 2017 will be its second year hosting weddings, and I had the pleasure to photograph the wedding of one of the men who constructed it. 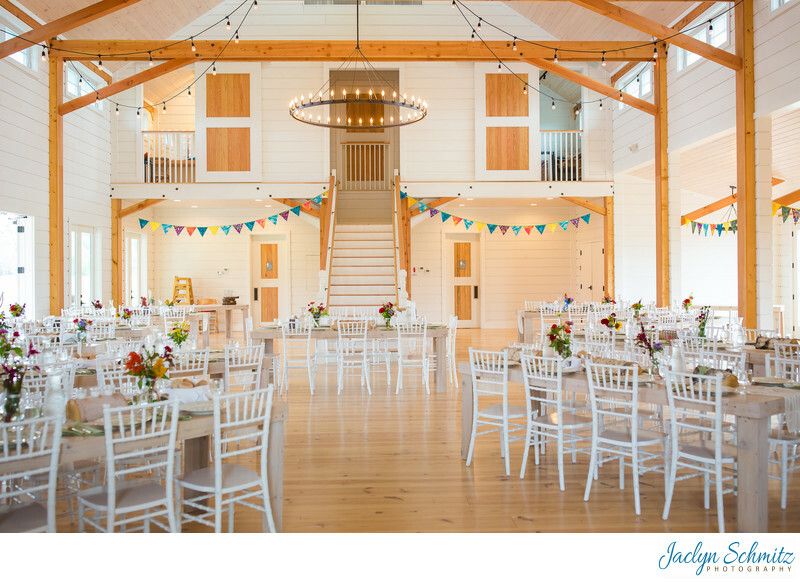 Since this barn was built from scratch, the owners had the fortune to design a barn with weddings and events specifically in mind. One of the biggest features that makes this barn stand out is the amount of natural light streaming through the many windows and bouncing off the white shiplap walls and blonde wood floors. Large modern chandeliers hang from the cathedral ceiling. A white staircase leads up to the getting ready room, which has its own crystal chandelier, a huge mirror, and an upscale bathroom with marble counters and a glass rain water shower. If you're looking for a cross between resort lodging and a barn reception, The Mountain Top Inn is one of the most popular choices. There's no need to worry about where your traveling guests will stay: this resort has 32 rooms in the lodge, 4 pet-friendly guest cabins, and 23 private guest houses. There are multiple reception sites, but I'm going to focus on the barn. 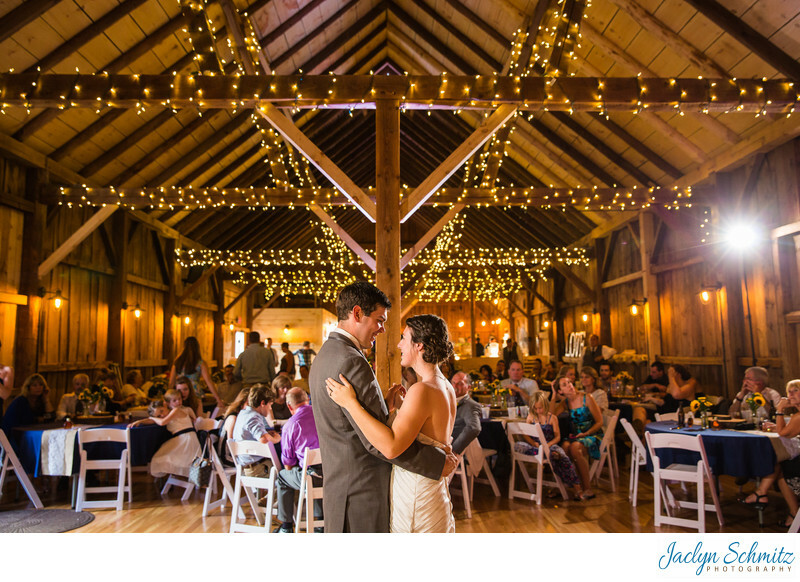 Steps away from the resort, the modern two-story four season barn can easily fit very large weddings. 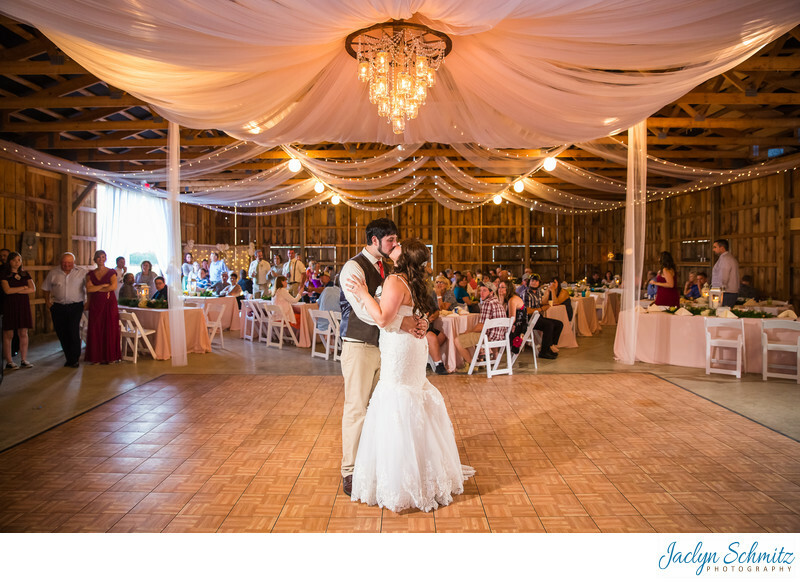 It has a convenient solution for rain woes, in that the loft in the barn is large enough to host the ceremony, so there is no need to rearrange the reception tables. 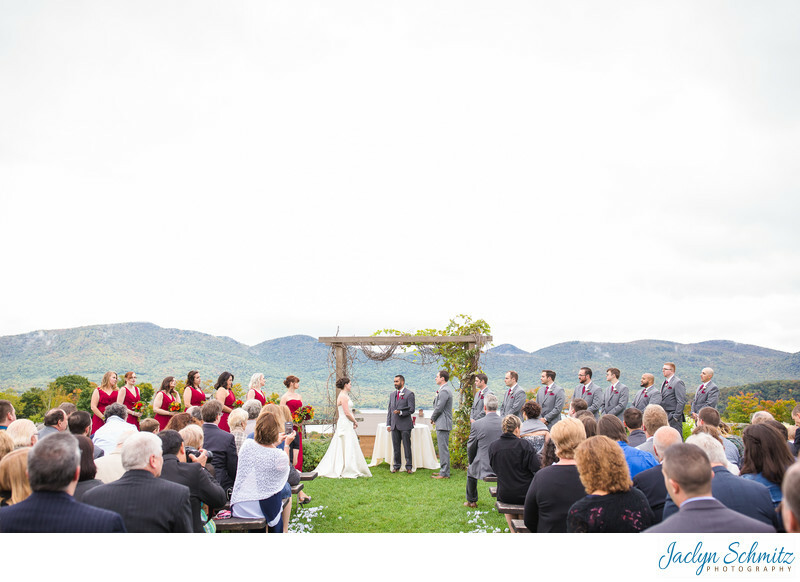 Ceremony options include the lodge's stone patio, or a grassy hill above it, and both locations have--wait for it--panoramic views of the lake and mountains (who woulda guessed?!). 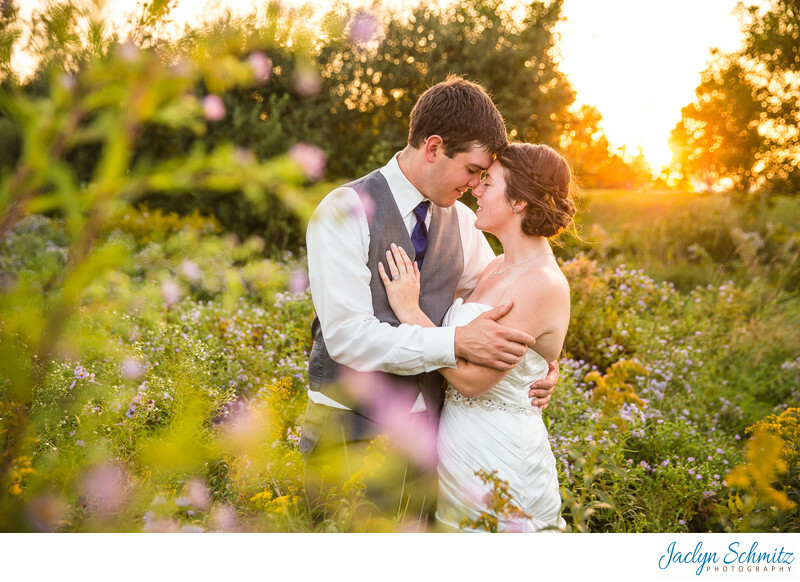 There is a third ceremony location down near the lake as well which is suitable for smaller weddings. This event center has multiple large barns on the property and is a complete blank slate. If you are planning on a large wedding, the affordable rate of Franklin County Field Days makes it an attractive option. 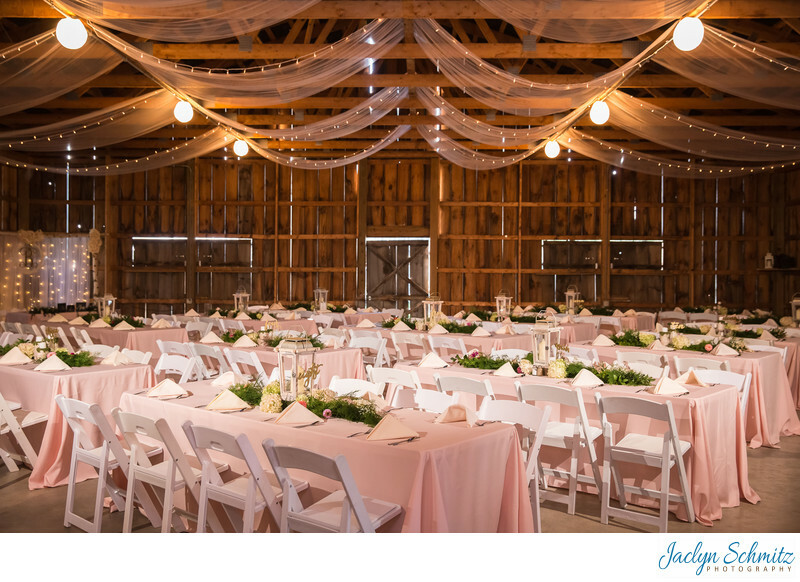 You also can have an entire week to set up, which is awesome because these simple barns really clean up nicely with a little decorative touch. The one downside is unlike other Vermont barns, this location does not have mountain or lake views. The grounds are normally used for local agricultural fairs, so there's a lot of open space, and the landscaping is kept very simple with trimmed grass and a small garden. However don't despair if you think that means boring portraits! There's a lot of fun ways to play with the many barns on the property, and if you really need some greenery, there's a gorgeous spot just 8 mins down the road at the Swanton Historical Society (make sure you check with them before showing up).